These are specialized devices, and while the standard (lower-powered) device is sometimes used in home or office settings in conjunction with one of the Coherent Space devices, these devices are primarily employed in commercial, agricultural or industrial settings to assist with dealing with odors and/or runaway oxidative or putrefactive processes, or with waste treatment or wastewater remediation. While each of them does exhibit at least a very mild quantum coherence field effect for a limited range, that is not their primary purpose nor intent, and instead, these devices are intended -- for optimal results -- to be operated in conjunction with one of our Quantum Coherence devices (here) which will be treating the same area or space. Negentropic (Anti-Entropic) Field Effect Device, PoP Prototype Model NFED-23 - Discontinued. Ultra Negentropic (Anti-Entropic) Field Effect Device, PoP Prototype Model UNFED-43 - Discontinued. I sometimes refer to this negentropic or anti-entropic effect as an antioxidative effect as well. This device is usually installed as an ancillary to an active Coherent Space Quantum Coherence device, although some applications (i.e., a barn or waste pond) may allow installation of only the Negentropic Field Effect Device without concomitant presence of an active Coherent Space Quantum Coherence device. This is an active device, meaning that it is powered by one AA high-end high-performance alkaline, titanium-alkaline or lithium ion battery, which should provide about two to four years of service with device turned on. The effect of this device -- in certain settings -- seems to be a pronounced negentropic (aka syntropic or anti-entropic), antioxidative and even a deodorizing effect (due to syntropic and antioxidative field effects on a "subtle energy" or quantum level). The device also seems -- in certain settings -- to inhibit the growth of oxidative decay and putrefactive microbes, and to encourage growth of some varieties of syntropic antioxidative microbes (SAM), including varieties of purple non-sulfur bacteria (PNSB) and Bacillus subtilis var. natto. The negentropic antioxidative effect is much more pronounced than that of the standard active Coherent Space quantum coherence device, although some of the other effects (i.e., much of the NCI-abatement and quantum quieting effect) offered by the Coherent Space quantum coherence device are missing. Radius of range of strongest effect seems to be about 350 feet, while radius of range of moderately strong effect seems to be about 480 feet. Device treatment pattern is entirely omnidirectional, meaning that the effect reaches in all directions. This device also appears, in some settings and under some conditions, to exhibit effects which increase in-service lifetime of alkaline and zinc-carbon battery cells if cells are pretreated by placement on or near device case for 12 to 24 hours before use. This device is designed for 24-hour-per-day use in a home, office or light industrial space, and -- with some exceptions -- is normally intended to be used in conjunction with a Coherent Space Quantum Coherence device which has also been emplaced to treat approximately the same area. Beyond the use of the HO-09 model of the Quantum Coherence device, this is the only other Coherent Space device which I operate full-time, 24 hours per day, in my home and laboratory. All critical components are sealed in a specially-treated epoxy potting compound in a hardy black plastic case, usually about 8" x 6" x 3", although exact size will vary across prototypes. You will need a small Philips-head (cross head) screwdriver in order to remove the four screws securing the case and install the AA battery (supplied) in its holder; the battery is removed for shipping. Price: $900 plus S/H. S/H: $30 for domestic mainland US, UPS Ground or Fedex Ground Shipping only. OEMs: please contact us for pricing, terms and availability, and for info on full technology disclosure. Much as with the standard Negentropic Field Effect Device listed above, I sometimes refer to this negentropic or anti-entropic effect as an antioxidative effect as well. This device is a far higher-powered version of the above-listed standard Negentropic Field Effect Device, (model NFED-23) and this UNFED-43 industrial device is normally employed only in industrial and waste treatment settings, for specialized purposes such as treating odors in barns or waste settings, treating batteries in some specialized settings, or for treating waste, wastewater or polluted water. As such, this device is usually installed as an ancillary to an active Coherent Space Quantum Coherence device, although some applications (i.e., a barn or waste pond) may allow installation of only the Negentropic Field Effect Device without concomitant presence of an active Coherent Space Quantum Coherence device. This is an active device, meaning that it is powered by one AA high-end high-performance alkaline, titanium-alkaline or lithium ion battery, which should provide about two to three months of service with device turned on. This device has been designed to implement a far stronger field effect than that evinced by the Negentropic Field Effect Device listed above; this device is designed only for specialized industrial and waste treatment settings. The effect of this device -- in certain settings -- seems to be a very pronounced negentropic (aka syntropic or anti-entropic), antioxidative and even a deodorizing effect (due to syntropic and antioxidative field effects on a "subtle energy" or quantum level). The device also seems -- in certain settings -- to inhibit the growth of oxidative decay and putrefactive microbes, and to encourage growth of some varieties of syntropic antioxidative microbes (SAM), including varieties of purple non-sulfur bacteria (PNSB) and Bacillus subtilis var. natto. The negentropic antioxidative effect is much more pronounced than that of the standard active Coherent Space quantum coherence device, although some of the other effects (i.e., much of the NCI-abatement and quantum quieting effect) offered by the Coherent Space quantum coherence device are missing. Radius of range of strongest effect seems to be about 750 feet, while radius of range of moderately strong effect seems to be about 1,200 feet. 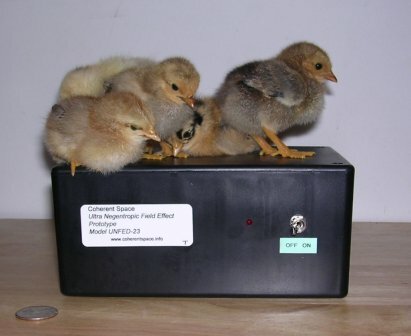 For certain effects, such as treating batteries or nutritional supplements, it is best to place the items to be treated on or near the device enclosure -- and within at least two feet of the enclosure -- and to leave the power switch for the device turned on for the required duration. This device is designed for intermittent use -- or, in special cases, 24-hour-per-day use -- and only in industrial and commercial production space and in barns and waste treatment settings. And -- with some exceptions -- this device is normally intended to be used in conjunction with a Coherent Space Quantum Coherence device which has also been emplaced to treat approximately the same area. Price: $1,100 plus S/H. S/H: $30 for domestic mainland US, UPS Ground or Fedex Ground Shipping only. OEMs: please contact us for pricing, terms and availability, and for info on full technology disclosure. This is a device intended only for industrial, agricultural and waste treatment settings, and it will not be sold if there is any possibility that the purchaser may intend to use it for home or office use.